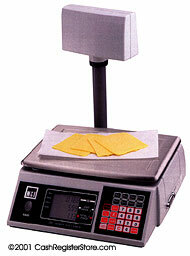 NCI 6420T Electronic Weight Scales at Cash Register Store.com. Additional features include a 15 inch rear customer tower display, 28 key keyboard, a stainless steel platter, and the option to run on standard wall mount electricity or on alkaline batteries. With new Duracell batteries you can expect to run for up to 800 hours without an AC adapter.